LIVERPOOL AND NETHERLANDS defender Virgil van Dijk is “too laid back” and must improve, according to his national team coach Ronald Koeman. Koeman’s side were edged 2-1 by World Cup champions France last month, Van Dijk beaten to a cross by Olivier Giroud for the winning goal in the Nations League clash. Van Dijk, widely regarded as one of Europe’s best defenders, also gave away a penalty for Liverpool against Manchester City on Sunday, but Riyad Mahrez sent his spot-kick over the bar. Koeman, who signed Van Dijk at Southampton in 2015, said he wanted more from the star centre-back. “I told Virgil within 30 seconds of the end of the game against France what I thought,” he said. “I know him so well — and that means I know where all his little faults are. Netherlands are preparing for a Nations League clash against Germany before meeting Belgium in a friendly. 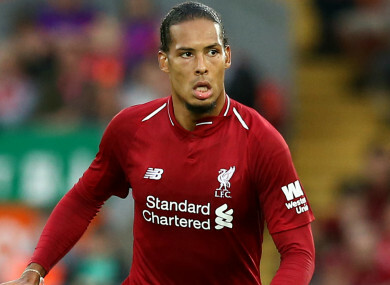 Email “'Sometimes he is a little too laid-back' - Dutch boss says Van Dijk must improve”. Feedback on “'Sometimes he is a little too laid-back' - Dutch boss says Van Dijk must improve”.